In this post we put together information and ideas contained in previous parts of the analysis, in order to find out exactly where it is that evil high-ranking Mormons and Freemasons, evil hermaphroditic Jews, highly-placed radical feminists, and the other parties involved (i.e., certain Mennonites, members of certain North American Indian tribes, and possibly Rosicrucians and other parties), plan to physically locate their New Jerusalem (that is, their 'paradise'). The smaller map above shows, at the points of the pentagram, the titles of five of Michener's novels that inform us as to some of the specific Indian tribes to be gathered. Based on the intersecting lines on the large map, it appears that the New Jerusalem is to be located somewhere in far northeastern Texas, but these lines are drawn on a flat map. However, the Earth is spherical, so the shortest path between any two points on its surface is always a minor arc of a great circle. Therefore, to determine the actual geographical location of the planned New Jerusalem, what needs to be computed is the latitude and longitude of the point of intersection of the two minor arcs 'represented' by the two longer straight lines drawn on our map of North America (the lines between locations near Palmer, Alaska, and Cap-Haïtien, Haiti, and between Lahaina, Hawaii, and Jamestown, Virginia). [c] Using the 'Movable Type Scripts' website (URL = http://www.movable-type.co.uk/scripts/latlong.html) and the 'Great Circle Mapper' website (URL = http://www.gcmap.com/), the intersection is found to lie in southern Indiana, not far from the city of Louisville, Kentucky near the Ohio River. Specifically, the point of intersection lies in Crawford County, Indiana, close to Milltown (see Google map here). This is the actual current planned location for New Jerusalem. At some point in history, the Mormons decided to acquire the land itself on which to place New Jerusalem, from American Indians. Indiana's name means "Land of the Indians" or simply "Indian Land." The point on the Google Map linked to above, lies on land that was acquired from local Indian tribes in 1804 under the terms of the (second) Treaty of Vincennes (or possibly, under the Treaty of Grouseland in 1805). There is also an LDS stake (i.e., stake of Zion) on this land. This stake was established on October 24, 1982 in New Albany, Indiana, which is just to the north and west of Louisville, Kentucky. There is also an LDS stake in Louisville itself. The tribes to be gathered from Oklahoma account for five of the ten tribes to be assembled in the evil parties' New Jerusalem. The other five come (one each) from the other five of Michener's 'Indian novels': Alaska, Hawaii, Chesapeake, Caribbean, and Mexico. As far as exactly why it is that the elite parties want to include these various groups of native peoples in their New Jerusalem, it must be the case that they intend for these people to be employed at the 'low-status' jobs and tasks, such as common laborer, waiter and waitress, cleaning maid, etc. The idea is to convince each group of people that they are descended from one of the lost tribes of Israel, so that they will fit in in New Jerusalem. The Mennonites are to be employed in positions requiring more skill, such as that of craftsman. Other clues in chapter 10 of Texas indicate that Michener believed that New Jerusalem was formerly to be located in or near Wichita Falls, Texas. (Chapter 10 of Texas is set in the mid to late 1800's.) There are also indications in Texas, that the city of Charleston, South Carolina was, at some point, a planned location for New Jerusalem (i.e., at some point in time prior to Wichita Falls being such). In his novel, Michener depicts Charleston as a kind of 'fallen city', in the same vein as Rome. Also, in chapter 9 of the book ("Loyalties"), one of the characters who lives in Charleston has the same name as a Roman emperor, Trajan, who is best known for his extensive public building program which reshaped the city of Rome and left multiple enduring landmarks such as Trajan's Forum. Another well-known structure in Rome (though not built by Trajan) is the Aurelian Walls. According to the 'Rediscovering Charleston's Colonial Fortifications' website, "Between 1704 and about 1730, sixty-two acres of the town [of Charleston] were enclosed within a network of walls and bastions and surrounded by a moat. The three inland walls were leveled around 1730 (an exact date has not yet been found) to accommodate civic expansion, but over the next half century the colony’s Commissioners of the Fortifications built further defensive works to protect the town’s south, west, and north sides...Charleston’s defensive fortifications were dismantled in the mid to late 1780s, after the conclusion of the American Revolutionary War, but there are three visible remnants above ground. "[g] The original intention for Charleston, as far as establishing a New Jerusalem there, was to use the city's existing or remaining colonial era fortification walls, adding to them as necessary, to protect the New Jerusalem from intrusion from the outside. Freemasonry's Supreme Council, Scottish Rite (Southern Jurisdiction, USA) was founded in Charleston in 1801.
a. 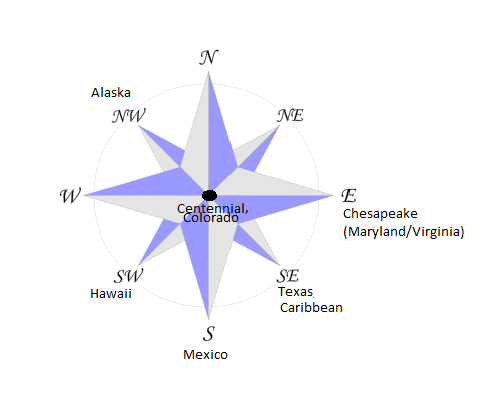 Image from the Wikipedia 'Compass rose' page; Compass rose en 08p by ElfQrin, licensed under CC BY-SA 3.0 via Wikimedia Commons; edited for clarity. b. Map of North America from the Global Overlay Mapper suite at the 'mapability' website, URL = http://www.mapability.com/ei8ic/. c. The line between central Mexico and Independence, Missouri, is a 'confirmer' line that the other two lines do intersect at the point shown, so this line is not used in the computation of where the lines intersect when drawn on a globe (although the evil parties do intend to gather some native Americans from central Mexico). The reasoning used to place the four endpoints (between which the two longer lines on the map are drawn), at their respective specific geographical locations, is given below. 3) Lahaina, Maui, Hawaii - In Michener's Hawaii, this area is indirectly referred to as a "promised land." (--Michener, James A., Hawaii, Fawcett Publications, 1959, p. 88.) What is meant by 'indirectly' is that it must be deduced from information given later in the book, that Maui is the island on which the book's earliest voyagers landed, in or near what later became Lahaina. d. Map from the Wikipedia 'Oklahoma Tribal Statistical Area' page, public domain, via Wikimedia Commons. e. In Centennial, there is a character named General Asher, and also, Pikes Peak is mentioned; the latter is a mountain in Colorado named in honor of American explorer Zebulon Pike. f. In Texas, there is a character named Reuben, and another named Efraín. g. "Rediscovering Charleston's Colonial Fortifications", FAQ's. Web. 29 Sep. 2015. URL = walledcitytaskforce.org/faqs.